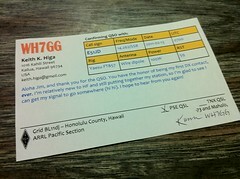 DXing :: Ham & Pineapple | A journey through the world of amateur radio. Zulu Sierra? Of course, Kilos and Whiskeys and Novembers are familiar sounds as fellow Americans, and I’d heard the occasional Victor Echo (Canada), Victor Kilo (Australia), and Zulu Lima (New Zealand). But Zulu Sierra? I had to check online to find out that it was…South Africa. South Africa! If I were to drill a hole in my floor, and through the center of the earth, I wouldn’t end up in China; I’d end up in Botswana – the country just north of South Africa. It’s about as far around the world as you can practically get. And yet, here was this station, working Japan on the long path (a path longer than halfway around the world), and coming into Hawaii as clear as a bell. He was still working Japan when it was time for the EARC net. When I heard my own call sign being phonetically spoken by the voice on the other end, I nearly had a heart attack. It works! It really works! We talked for about two or three minutes, exchanging the standard contact information. First, a signal report – I gave him a 59 (good copy, strong signal); he gave me a 56 (good copy, but weaker signal), and sharing our respective rigs. Then we said 73s (best regards), and he went on to work stations up north, and I went off to celebrate with a can of Coke. You never forget your first contact; it’s a great confidence boost. But what fascinated me was how I was able to work a station due south of me (on the island of Rarotonga) with a dipole oriented to radiate east-west. Within two days I worked three other stations – California, Japan, and another South Africa station. It’s amazing how with nothing more than pieces of wire, some electronics, and the atmosphere, two people separated by thousands of miles can have a conversation. That’s the magic.